Eileen Goodman never thought she would be a painter. Growing up in Montclair, NJ, she always drew a lot but was “pretty naive about painting.” Choosing illustration as a career, she attended what was then called the Philadelphia College of Art, which didn’t even have a major in painting. However, the faculty included a few serious painters, whose independent artistic expression suggested other paths. After a brief period developing a portfolio of commercial work, she followed in their creative footsteps. Putting down roots in Philadelphia, Goodman joined an art community in a city with an artistic legacy reaching back to our nation’s earliest days. Established in the early nineteenth century in this city, the Pennsylvania Academy of Fine Arts nourished a tradition of uniquely American realism, defined by such notables as the Peale family, Thomas Eakins, and The Eight. Today realism is as much a part of Philly as the Liberty Bell, cheese steak, doo-wop, and Rocky. Experimenting with smaller watercolor versions of her oil paintings, Goodman was attracted to the work of Pennsylvania modernist Charles Demuth, who is well-represented in the Barnes Foundation collection in suburban Philadelphia. Perhaps she recognized a similar sensibility in the watercolors of an artist who had exceeded the boundaries of illustration. Vividly direct, Demuth combined a facility to describe form through outline with exuburant gesture and saturated color. Eventually Goodman’s work in watercolor became dominant. In the early 90s, she painted a number of pieces measuring five feet across, a scale more commonly afforded oil paintings. Foregoing oils altogether, she found ways to make watercolor achieve astonishingly unexpected effects of tonality and texture. As with Demuth, properties which render and make real are energized by looseness in the brushwork and layering of color. Taking her inspiration from the “natural world,” Goodman chooses to work primarily in still-life and garden scenes. She may create a set-up on a table near a window in or home or find a spot in a friend’s or a public garden. Because she wants to capture a specific moment in time, she takes photographs, the composite of which becomes the basis for her composition. By constructing a grid, she transforms the photographic information into a pencil drawing on watercolor paper, which provides the underpinning for the painting process — a sort of trellis to support the flowering of her art. Recognizing a fundamental “longing for…connecting to the perceived world,” Goodman provides a banquet for the viewer’s hungry eyes. With the ability to evoke the very scent of flowers, the artist cares more “about the way something is painted” than any slick or formulaic representation. A subtle, knowing artist melds perception and practice in what is referred to as “surface,” an ineffable property in which individual formal elements and physical substances hold together. In Goodman’s case, her surfaces are lush, thus heightening the viewer’s sensory response to the natural forms depicted. With oil painting, the canvas or board usually serves as a support for the skin composed of pigments; but with watercolor, the paper itself becomes a fundamental component of the painting. From the wide range available, a skilled watercolorist chooses her paper thoughtfully. Goodman uses the heaviest cold-pressed Arches paper, a medium which doesn’t break down with repeated applications. Mixing various colors to create more resonant tones, she then allows the paint to dry and adds layers or details to build even more intense, deep hues. 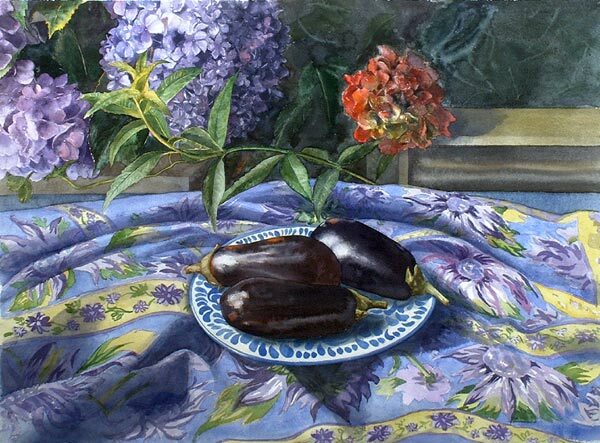 The cover painting Little Eggplants and Hydrangeas (2001, 29” x 41”, courtesy of Gross McCleaf Gallery)) shows Goodman’s stunning command of watercolor. The glossy, smooth rind of eggplant, with a color so unique it is synonymous with the vegetable, lends itself to the reflective glazing of oil paints. Yet Goodman takes indigo and alizarin crimson watercolor and paints eggplants so convincing the viewer is tempted to reach out and touch their rubbery curved shapes. Each blackish-purple form is distinct, as she deftly forms an edge. Throughout the composition, she contrasts light and dark as more typically found in oil paintings. By including the patterned cloth in the arrangement, she provides a rich experience of delicate tonal variations in blue and purple, and she creates visual excitement by puncturing the composition with crevices and folds. The shadows give weight and substance to the forms, such as those underneath the plate; but for Goodman, they also create the sense of mystery she believes is inherent in nature. Without using black pigment, Goodman composes passages from illumination to shadow meant to arouse emotional or psychological responses. The drama is intensified by the watercolor’s surprising size. Measuring over three feet across, the still-life elements are larger-than-life. Working at this scale, Goodman gives her watercolor effects a more physical presence. The artist’s free yet sure hand directs the watercolor, while allowing the fluid medium to skip and pool. Balancing control and accident, she playfully juxtaposes organic petals with flower-patterned cloth. Easily identifying the vegetables and flowers, we also feel summer’s exhilaration from the way Goodman animates the surface. The vitality of Goodman’s big, bold watercolors is characteristic of the woman herself. Teaching in a number of places, she had a lifelong association with the school where she was a student, which is now known as the University of the Arts. A couple a years ago, she took a leave of absence; but at age 66, she’s not quite ready to call this retirement. Divorced with a grown daughter, she enjoys having the time in which she can devote herself to her art. While not concerned with finding things to do, she loves to cook for friends, sharing a meal and some laughter. Years of experience have granted Goodman a keen understanding of her materials. Included in Charles LeClair’s, The Art of Watercolor, Goodman’s still-lifes are bravura performances that take even the seasoned art enthusiast by surprise. The woman who once knew nothing of the ways of the painter is now an expert watercolorist, well-respected in a city with an art reputation to live up to.